- - - - - Welcome to the Heian Period of Japan ! CLICK for more colorful photos !
. Nara Period (710 to 794) 奈良時代 . Mosts of the material is preliminarily collected on my facebook page.
. Join - Heian Period - on Facebook ! . Details of the period will be introduced. The many legends of this period, including legends and haiku about it, will be introduced in more detail. 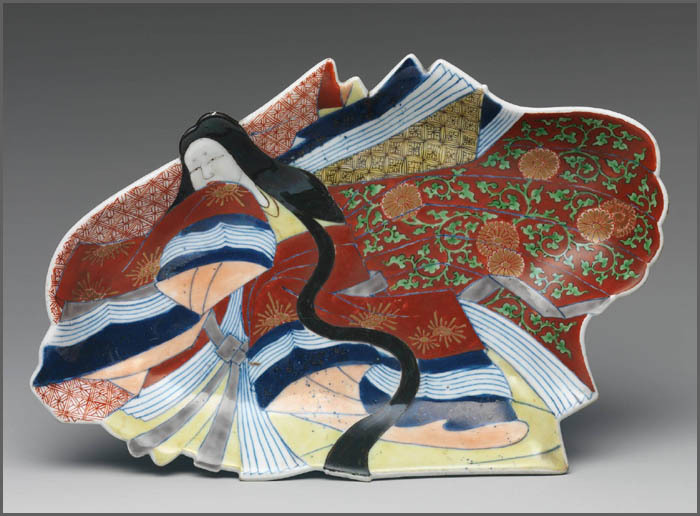 This BLOG also collects legends, tales and folklore of Japan.
. ABC List of Contents - Heian Period . A Gallery of the Darumapedia, Daruma Museum Japan.
. Books about the Heian Period .
. kojiki 古事記 Furukotofumi, the oldest chronicle in Japan .
. Persons of the Heian Period .
. Shrines of the Heian Period　神社 .
. Temples of the Heian Period　寺 .
. Legends and tales 伝説 . - - - - - . 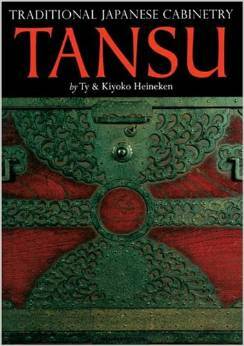 Anna Incident - Heian History .
. Aristocrats in the Heian Period . The Ashikaga Academy and Ono no Takamura 小野篁 .
. Asuka Kiyomihara Palace　飛鳥　清見原 .
. awabi densetsu あわび　アワビ　鰒　鮑伝説　abalone legends .
. Ban Dainagon Ekotoba 伴大納言絵詞 picture scroll about the fire of Otemon 大手門 .
. Bandits, Pirates, Robbers - Heian History .
. Binbogami 貧乏神, Kyuuki 窮鬼 Kyuki - God of Poverty .
. Buddhism in Heian Japan . - - - - - . Developments in Buddhism . Artwork of the new sects, Tendai 天台 and Shingon 真言.
. bussokusekika 仏足石歌, "Buddha footprint poems" .
. . . A glimpse of many shades of color at the neck, sleeve and hemline . . .
. Japanese Colors - Introduction .
. daidokoro, daibandokoro 台盤所 kitchen . Dazaifu 大宰府 regional government in Kyushu, "the distant capital"
from the 8th to the 12th centuries.
. dengaku mai 田楽舞 Dengaku dance .
. Echizen shikki 越前漆器 Echizen laquer ware . In 527A.D., when the 26th emperor of Japan was young, he ordered a lacquerware craftsman in Echizen to repair his crown . . .
. Food and Drink in the Heian Period .
. Fujiwara regency - Heian History .
. gangu 玩具, omochcha おもちゃ toy, toys . In the Heian period, it was called “mote (or mochi)- asobimono (mote or mochi means to hold in a hand, and asobimono means something to play with),” or it was referred to as simply “asobimono” in the Tale of Genji.
. Genji Monogatari 源氏物語 The Tale of Genji .
. Genpei War 源平戦争 - Heian History . the Minamoto (源) and the Taira (平). The Heian Period ends with the Genpei War.
. gold and silver mines - kinzan 金山 ginzan 銀山 .
. Gold and Silver, Zipangu .
. goryoo, onryoo 御霊、怨霊 vengeful spirits .
. Gozu Tennō 牛頭天王　Gozu Tenno Deity .
. hamaya 破魔矢 and busha matsuri 歩射祭 or 奉射祭 .
. Hanami　花見 "Blossom viewing party" .
. haniwa はにわ【埴輪】“clay cylinder”clay figures .
. Hashihime, Hashi Hime 橋姫 / はし姫 "Princess of the Bridge" . - - - - - . 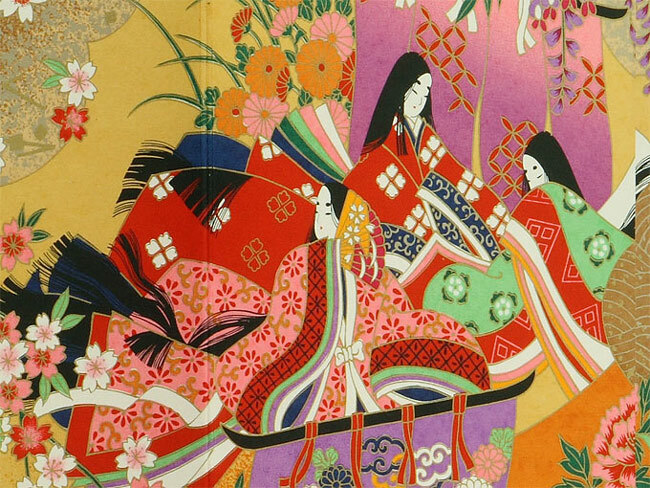 Aristocrats in the Heian Period - beauty . Heianjo, Heian Jo 平安城 "The Castle of Heian"
was one of several former names for the city now known as Kyoto. It was the capital of Japan for over one thousand years, from 794 to 1868 with an interruption in 1180. - - - - - .The Ancient Capital Heian Kyo - by Parker .
. Heian matsuri 平安祭 Heian festival - Kyoto .
. Heike densetsu　平家伝説 legends about the Heike clan .
. Heike tanuki 源平狸 papermache doll of a badger . at Temple Yashima-Ji 屋島寺, Kagawa. The Tanuki believed that his former master was a prince of the Taira clan.
. hinomaru, hi no maru　日の丸 the Japanese Flag . - - - - - Emperor Monmu used a flag representing the sun in his court in 701.
. hiragana　平仮名　ひらがな　writing system .
. Hiraizumi 平泉 in Iwate, the Golden Hall .
. History of the Heian Period .
. Hoogen no ran, Hôgen no ran 保元の乱　Hogen Disturbace - 1156 .
. ikiryō, shōryō, seirei, ikisudama 生霊 Ikiryo, "living ghost" .
. imayoo, imayō 今様 Imayo, popular song, imayoo uta 今様歌 .
. inbi no gohan 忌火の御飯 "rice on the memorial day" .
. Ise monogatari 伊勢物語 Tales of Ise .
. ishinago 石子 / イシナゴ　/ いしなご / 石なご / 石投 / 擲石 toy stone pebbles .
. Jishin no Ran 壬申の乱 Jishin war - 672 .
. Kagerō Nikki　陽炎日記 / 蜻蛉日記 Kagero Nikki, The Kagero Diary .
. kaiawase, kai-awase,kai awase 貝合; 貝合わせ shell-matching game . Kichiji Nobutaka, Kitsuji Sueharu, Kane-uri Kichiji .
. kanju manju 干珠満珠 the tide jewels .
. kaoo, kaō 花押 Kao official signature .
. Kappa 河童 Water Goblin Legends of the Heian period .
. karuta, uta karuta 歌留多 Poetry card game .
. Kawara no In 河原院 Kawara-no-in - Kyoto .
. kemari 蹴鞠 kick ball .
. Kimigayo 君が代 the Japanese Anthem .
. juuni hitoe　十二単衣　12 layered court robe .
. Kinoshitagoma, 木ノ下駒 horse toy from Sendai .
. Kokushi 国司 Kuni no tsukasa, regional governor .
. Korean heritage 韓国　Kankoku 朝鮮 Chosen - Korea .
. koyomi 暦 Japanese calendars . introduced in the Joogan 貞観 Jogan period (859 - 877).
. Legends of the Heian Period .
. 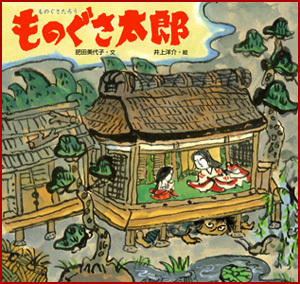 Literature of the Heian Period　平安時代の文学 .
. by Sei Shōnagon 清少納言 Sei Shonagon . Poetry "Collection of Ten Thousand Leaves" .
. Masakado's Rebellion - Heian History .
. Matsuo Basho　松尾芭蕉 in the footsteps of the Heian period .
. mokkoogata, mokko no katachi 木瓜形 four-lobed pattern .
. Motives and Symbols in Art .
. Nihon Ryōiki 日本霊異記 Nihon Ryoiki .
. norito 神詞　のりと Shinto chants, incantations and prayers .
. Nue - Yorimasa and the Nue monster (鵺, 鵼, 恠鳥, or 奴延鳥) .
. Ogura Hyakunin Isshu 小倉百人一首 Poetry Collection of 100 Poets .
. onmyoodoo 陰陽道 Onmyo-Do, The Way of Yin and Yang .
. Onsen - Eight famous old Hot Springs 八古湯 and their legends .
. plum blossoms 梅花 loved in the Heian period.
. red and white 紅白 kohaku (koohaku) .
. samurai　侍 Samurai - servant . In the early Heian period the word samurai meant servant and it had no military connotation and did not refer to a person of elite status.
. 4 The beginnings of the warrior (bushi) class - Heian History . - - - - - . Rise of the military class .
. Sarutahiko densetsu 猿田彦伝説 Sarutahiko Legends .
. seko, haishi 背子 light robe or lover-friend . Senzai Wakashū 千載和歌集 "Collection of a Thousand Years"
a title given to a regent who was named to assist either a child emperor before his coming of age, or an empress. Shika Wakashū 詞花和歌集 "Collection of Verbal Flowers"
. 2 The development of the shoen system - Heian History . darani 陀羅尼 spell against the monsters and demons that haunted the capital in the Heian period.
. soohei, sōhei 僧兵 Sohei, monk-warrior, monk-soldier .
. Sumitomo's Rebellion - Heian History .
. . . . . provincial official and pirate, most famous for his efforts to establish a sort of pirate kingdom for himself in the Inland Sea region between 936 and 941.
. Suzakumon 朱雀門 Suzakumon (Shujakumon) Gate .
. Symbols and Art Motives .
. Taika Reform 大化の改新 Taika no Kaishin - 645 .
. Takenouchi Monjo 竹内文書 Takenouchi Documents .
. Taketori Monogatari 竹取物語 Tale of the Bamboo Cutter (Kaguyahime かぐや姫) .
. temari 鞠（まり）- 手毬（てまり）hand ball, rag ball .
. “Time in Medieval Japan” - symposium 2018 .
. tomoe 巴（ともえ）Tomoe pattern . This pattern first appeared in the Heian period . . .
. Tosa Nikki 土佐日記 Tosa Diary .
. Tsunami 津波 History since 684 .
. Waka poetry and Buddhism 和歌と仏教 . “Yamashiro” was formerly written with the characters meaning “mountain” (山) and “area” (代); in the 7th century, there were things built listing the name of the province with the characters for “mountain” and “ridge”/“back” (山背国). On 4 December 794 (8 Shimotsuki, 13th year of Enryaku), at the time of the christening of Heian-kyō, because of the resultant scenic beauty when Emperor Kammu made his castle utilizing the natural surroundings, the shiro was finally changed to “castle” (山城国).
. yami - Heian no Yami 平安の闇 The Dark Side of the Heian Period .
. yookai, yōkai 妖怪 Yokai monsters, ghosts, spooks .
. Yuge no Miya 弓削の宮 / 弓削宮 - Osaka .
. 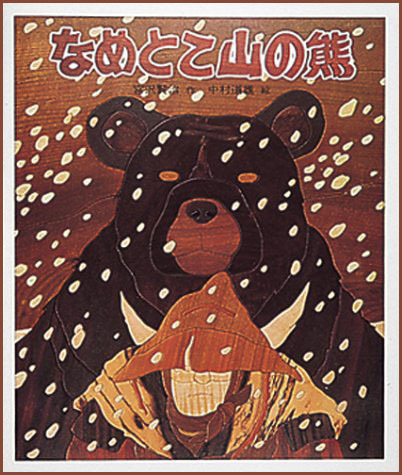 Newsletter - Latest Additions .
. ABC List of Contents - Nara Period 奈良時代 .
. Kuma, bears and kigo for Haiku .
. matagi 又鬼 - マタギ と伝説 Legends about bear hunters .
. A bear present from Yamanokami 山の神 God of the Mountain .
. Tengu 天狗 and hunting for bears .
. animals and their legends 動物と伝説 - - ABC list .
. plants and their legends 植物と伝説 - - ABC list .
. trees and their legends 樹木, 木と伝説 - - ABC list .
. 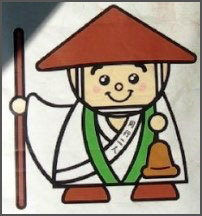 Persons, People, Personen and their legends - - ABC list .
. boozu　坊主 priest, お坊さん　O-Bo-San . soojoo. sôjô 僧正 high-ranking priest, "archbishop"
. aoboozu 青坊主 Ao-Bozu "Blue Priest" Yokai monster .
. soroban boozu 十呂盤坊主 "the Abacus Priest" .
. kitsune 狐 fox and tanuki 狸 badger turning Bozu .
. Toofu Kozoo, Tōfu kozō 豆腐小僧 Tofu Kozo, The Tofu Boy . 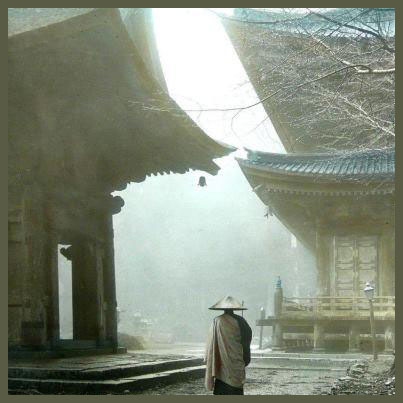 She saw 小僧 a young temple acolyte with a sedge hat coming from the river. This must be the spirit of the bracken, she thought and swung the hatched in a circle. The young acolyte jumped in astonishment, turned into a pebble and fell back into the river.
. warabi わらび(蕨) bracken, fern .
. Hitotsume Kozoo 一ツ目小僧 (一つ目小僧) Hitotsume Kozo - Young Monk with One Eye . 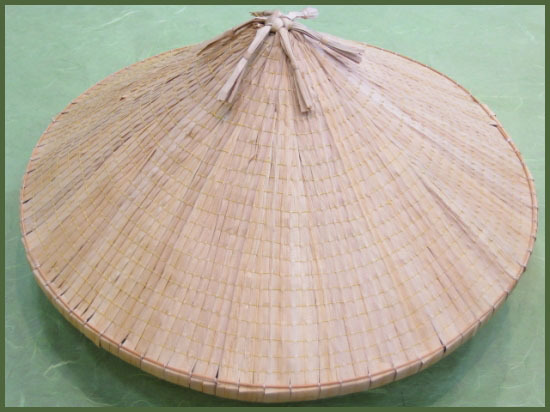 If a fisherman helps the Umibozu or Namikozo, he will be able to predict the weather according to the sound of the waves.
. sedge hat, sugegasa　菅笠 . The lord of the castle from 重茂山 Omoesan, 岡部十郎 Okabe Juro, had a daughter who was quite intelligent and beautiful. After the castle was lost in war, she survived and tried to re-gain her former estate. But as she fled, her pursuers recognized her by the damaged sedge hat, so she sat down and killed herself. 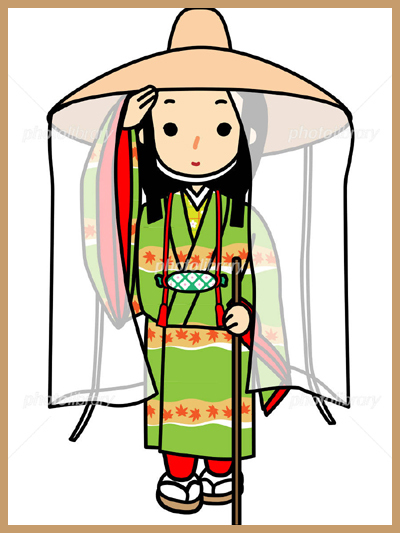 The villagers later built a small Shrine in her honor and venerated her as Benten Sama with a special hat for women. If someone comes to this Shrine and makes a vow never to wear a sedge hat, he will find divine protection.
. Benten 弁天と伝説 Legends about Benten . Once a man prayed to his ujigami 氏神 family deity to make him rich, even if he must give his daughter as a sacrifice. On that night, his daughter died. On the evening of the seventh day after her death, the spirit of wealth appeared and showed him the way to a treasure. But there was a strong storm and wind that night and by the time he reached the spot, the treasure had gone. A sedge hat with the inscription 牟田尻の善助 Mutajiri no Zensuke had fallen down on the spot. 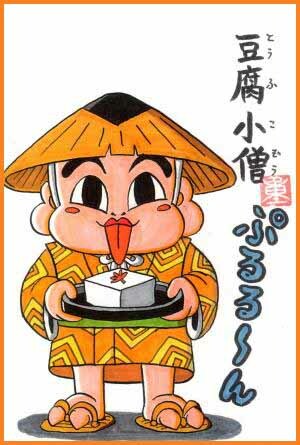 The man kept this hat as a treasure and soon became rich after all.
. ujigami 氏神 the Clan deity, family deity . 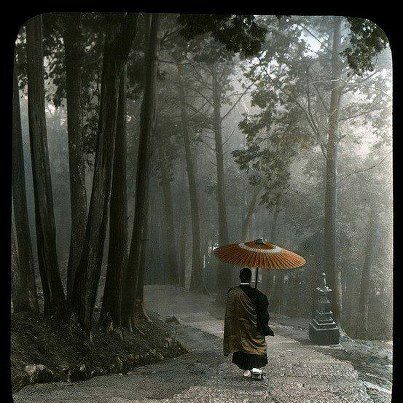 Once upon a time, a short man named 覚太郎 was walking over 赤花峠 the Akabana pass , when a sedge hat came rolling down. He wanted to catch it but it moved on and he followed it. Later someone saw two beautiful girls coming down the pass, but when he came closer they turned into boozu 坊主 priests. This must have been the prank of a fox or Tanuki, he thought.
. boozu 坊主と伝説 Legends about priests . A long time ago, there lived an old man and a woman who were poor but kind. It happened on one year-end day. The old man and woman were making hats made from straw. They were going to sell the hats in the town and buy rice cakes for New Year. The old man left home with his five hats. Soon after he left, it began snowing. Because the snow became worse, he hurried his way to the town. When he arrived on the edge of his village, he found six Jizo standing in a row. Snow piled up on their heads and shoulders. The old man couldn’t pass by the Jizos as they were. The old man put his hats on Jizos, which he was going to sell in the town. But he only had five hats while there were six Jizos. Then the old man took his hat off and put it on the sixth Jizo. The old man told her about six Jizos. At that night, they heard a song in the middle of the night. ♪Where is the old man’s house? ♪We are here to give you a present in return. They heard a sound of leaving something and the voice disappeared after all. The old man opened the door quietly. Then he saw the back view of Jizos with his hats on. And he found tons of rice cakes for New Year and delicious foods in front of the house. "You are a fox, a fox!" and begun to slash the woman with her knife. She would not stop and the sedge hat of the woman was all in tatters, even her face had great wounds.
. Sedge hat and Yamanokami .
. rice-planting woman, saotome 早乙女 / さおとめ . satsuki me 五月女 "woman of May"
. Tengu legends from Ehime . Once a saotome 早乙女 rice-planting maiden was singing a song, bending toward the direction of 久保田の天狗嶽 Mount Tengudake at Kubota. The Tengu came close and wanted to imitate the song, but could not sing as beautiful as the maiden. The Tengu got angry and since then during the rice-planting season it always rains. At 氷室 Himuro was a person who could use Ninja tricks. saotome o odorasete miyoo 早乙女を躍らせてみよう "Let us make the Saotome women dance!" He threw some tree leaves on the ground and the women bagun to dance. The 湖山長者 rich man from Koyama always employed many Saotome to have his fields planted in just one day. In one year during the time of rice planting, a mother monkey came along with his baby head-down on her back. The Saotome women looked at her for a long time and could not finish all the fields on this day. So the rich man took his hand fan and pointed it toward the sun, blowing it away for just one hour longer to finish the rice planting. His fields were planted, but as a punishment the Sun now sent water to flood it all in one day and make a lake out of it.
. Saotome and Yama no Kami 山の神 God of the Mountain . 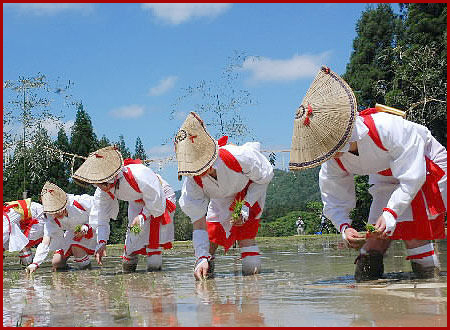 On the Seasonal Festival in the fifth lunar month the Saotome are allowed to throw mud at the young men of the village. If they do not do this, something bad will happen.
. daija, orochi 大蛇 the huge serpent, great snake - legends . One year during the rice-planting season, a huge serpent had swallowed all the Saotome girls, but the kushi櫛 comb of one girl got stuck in her throat and she died. In memory of this event the villagers built the shrine 櫛田神社 Kushida Jinja. The wife of Monogusa Taro had died and he had to care for the fields alone. Among the Saotome he had hired there was one who worked very hard, like four or five persons at once. He took her as his wife and soon they had a son. When the boy was three years old, the woman suddenly turned into a fox and left the home. Now Monogusa Taro had to take care of the child while dilligently doing his farm work. He soon became rich and prosperous. The Fox-Child lived to the ripe age of 80 years and his descendants all became rich farmers. 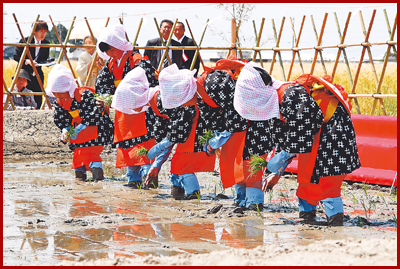 The fields for planting in one day had been decided for each Saotome. In the evening one girl had almost finished and bend her head down to peek through her legs - to see that a big part was still unfinished. She was quite surprized that soooo much was still not done that she fell down and died on the spot. Since then, this field is called Saotomeda 早乙女田 field of the rice-planting maiden.
. tansu 箪笥 / 簞笥 -- たんす chest of drawers, Kommode . This Pipe Fox takes the riches out of other homes Tansu and brings it to his Master's home. He jumps like a small cat out of money boxes and rice boxes.
. okame おかめ / 面 a laughing face mask o O-Kame san .